I have been looking on/off for several years in the Reno area for land. I need to get out of Ca and all the things they keep doing and telling me I can do. Taxes and cost of living is another reason. I retired a few years back and this has been something I wanted for a long time. My parameters are 2-3 hours driving time so day trips or working weekends don't kill me. Reasonable 12 month access and no HOA. No dirt plots or on a main road. Dirt is going for nothing, like 5k for 20 acres, nicer lots are going for 1-2k/acre+, real nice is like buying in Ca, nuts and they had HOAs! Talked to several real estate agents who pointed me to the Palomino Valley area north of Sparks. I had been looking around Carson/Mindenville/Dayton, but prices were nuts and much of it was dirt! The area looked OK about 20 min north of Sparks. Plus it had all the shopping you could want within 20 minutes driving. I had set my mind to 20+ acres and started searching al the land sites. Most lots were around 40 acres. Some were way out and way up high, others were low in the valley but over priced since it was "horse" land. Several caught my eye, but you really don't know until you look. I searched and found about 10 lots to look at this weekend and was not thrilled by any. They were OK, but either to far our, up high or had terrible access. While up on 1 of the higher lots I looked down and saw an area that looked pretty nice. I figured what the heck, lets go look. Saw a few lots with real estate signs, but most were lots right on the road or with houses (out of budget) and I drove a "for sale by owner sign" and thought what the heck. Called and asked about the lot. It was 52 acres for just under 2K per. He tells me where it is and I go up. About 10 minutes later he shows up points out where it really is and has the maps to go with it, lot right next store was just purchased. So with that I walked around really seeing what it was. With what I had seen I really liked this. Rolling mountain area desert with plenty of vegetation, no real trees though. Power right to the edge and the road stopped there too. Couple houses on the next ridge with good roads and the road ends at power poll. Called the guy back, we met, I made an cash offer and cut a deal well under the 2K per acre. Left a small deposit and and supposed to sign in a week. 52 Acres, power, no water or septic. Only real issue is water which I will haul in for awhile. Wells I am told are going 600 ft to the tune of 20-30k. Septic I can do. So about a year ago I transferred my mothers camry over to me for insurance as she could no longer drive. When I transferred it, they gave me new Ca plates, which I don't understand and I turned in the old plates. Over the last year I have gotten several letter to pay the old registration from DMV. Now I get a demand letter from DMV to pay, who has turned it over the tax board for collection with threats of wage garnishment, revoking state license's, property and bank liens. All this over a car registration that was transferred? This state is getting so bad I may just buy a peice of dirt to get out of here. So a month or so ago I saw a pic of the new chevy and thought it looked a little like the Toyota Tundra. Well, I saw one in person today, a 1500. I really thought it was a Tundra until I saw chevy across the back. I mean mirror image hense the grill a little. No wonder GM is laying off thousands. CIEMR / What was he thinking? An Antifa father up in OR, what was he thinking? Sounds like even TX is getting pushy, but the good guy prevailed! General Vehicle Related Discussion / Headlights, agian! Well, I added the JDM NX LED bulbs to my Dmax and so far I really like them. In fact I just ordered the same bulbs for the high beams. Now 2 setbacks, my "all on" stopped working when I put in the LEDs?? Maybe the relay, just haven't checked. What is the mod with the diode for all on again in the fusebox? That or the pc board. Still in the stock housings too. Is there something better or stock housings the beast?? May as well get going on this as so much is flying through my skull I need more to muddy it up. I have been thinking of some land for some time now and now it should come to pass. Want it backed/sided to open/blm land so as not surrounded and no HOAs with easy to handle building regs. I am looking south of the Reno area, which allows decent access from several highways in about 3 hours. I budget in mind, but a little flexible depending on the parcel. I do not want a plod of dirt in the middle of more dirt! Build Threads / Spartan part 2, Suburban build. Figured A new thread is in order with a new (older) base Suburban. Haven't got it home yet, but paid for and registered. No Smog!!!! Took a few more pics and here is where I am starting. Dropped a grand on a set of Cooper Discoverer MTPs 37/12.50-17 today. Will be that much after rebates and 9 months same as cash helps. Won't go on right away, still have some tread left and the lift still has to go on. Hopefully this will push me to get it going as it needs a regear the same time (3:73 to 4:56). So for I like the coopers and reviews are good on this as well. Better hwy use without loosing off road grip. Financial Prep / Investing for income after home sale? Well, as many of you know I am about to place mom in an assisted living facility. Issue is it costs more than she makes and I can make up. Monthly rate is around $3500 and her income is about 2K. I am looking at veterans spouse assistance, but not looking good now as they were still married, but separated. Military retirement looks low too at jut $175 month. Answer I have come up with is to sell her home, invest the profit (about 275K) and use that to cover the extra monthly cost. I have talked to my financial advisor and he recommends and annuity for just the income end of it. I am no fan of them and still looking at options. It does have a 5+ interest rate garanteed, which is what I need (about $1500 month) Fee's are 2.5 up front and 1% year after that. Another is to get CD's and roll them over now and then using the dividens for the same use. Principle is gauranteed, but interest can go up/down with renewal. Same idea on mutual funds, but same issues as with CD's for the most. Per my tax guy the annuity would have little or no tax issues and she pays no taxes now or need to file with current income. Nothing is going to happen quick except her placement. Getting the Dr paperwork monday, then getting her in just the home paperwork. It is a nice place nearby https://www.brookdale.com/en/communities/brookdale-vacaville.html and even closer to me than where she lives now. Anyway, any more ideas from you guys or feedback? Finally decided to get a real boat. Was not going to drop $25k on a new boat so I started looking on CL via "searchtempest". Wanted something in the 18-20ft area with an open bow for fishing and the extra room. Wanted a V6 but V8 would do, the 3ltr 4cyl was underpowered by all reports. I wanted something clean looking and NO PROJECTS! I found a list of 8 or so in the 2k-8k area, 8k was pushing it. Went by a couple local boat stores and went real shopping on Sat. This 1993 Chaparral 1800 SCL had all I was looking for. Price was a little more than NADA but for the hours (just 116) and all the little extras I paid $4300. Came with about every little thing you need, plus ski ropes and ski's. Anchor, paddles, PFD, cover and a full tank of fuel. It has a few little dings and scratches, but it is 25 years old. Picked it up from guy who got a bigger boat in Stockton. Pulled it down to Bass Pro shop in Manteca, then home. Pulls great, can hardly feel it. No brakes but it weighs just 2500 with trailer and my 6in drop hitch was perfect for it. It runs smooth as silk and will get my trail tomorrow at Berryessa. Have to rewire the trailer today, but that is the worst of it. Wife and daughter are busy, so it will be the boys and I with a a friend of theirs. Berryessa is a large lake between Napa and where I live and has great fishing (crappie, bass, trout, cats, salmon and trout) with lots of open water for a new pull toy. The kids and I love getting out but haven't used the TH in years now. I keep pushing it but they do not like the work before and after its use, so it will go. With 2 lakes less than an hour from here, several more another hour out. Most Favored Companies / Best Insurance company? Have had good luck with them but might be time for a change, who likes who? I have auto, home, life and liability with them now, well someone. I don't qualify for USAA and thinking of looking at AAA for at least some quotes. Think life would be pricey right no with me turning 60 history, but I want it too. Shoot me some ideas guys! I have been looking for a wider cabinet for my Wabeco mill. It was a CNC mill and will be again but it needed a better home than the 30in cabinet it was on. I have done a full RnR on this mill after a garage fire, that left it in bad shape and cooked the CNC parts. So I found a 46in wide x 24 deep Husky cabinet last week. I had also wanted something with drawers vs the shelves for access. Plus at $350 vs the 1000+ I have been seeing it was an easy decision. Siting on the old 32 inch cabinet the tray and X bedway hung off the sides while working. Had a buddy at scouts make me a galv cover for it that fit great and the youngest and I did the swap today. I already had an attached chip tray that got in the way a little, but we got it. I need to reconfigure the wheels on my cherry picker as they won't go under the cabinets, but that is for another day. Started by cleaning it off some and wrapped a lift strap around the motor. This is a tabletop mill but still goes at around 200lb and is solid. We added double tape to tray under just the mill base. Then we centered and dropped it down, using a piece of flooring to get it centered before setting it down. I will then add a silicon bead around the tray keeping the nasty's from under it. I had to use wood and clamps to hold it as I slid the flooring out. Rear mark was a little off but it was dead on in the front and the rear was flush with the cabinet back so I was happy. D.O.T. / Does the new GM truck look like a Toyota? Sans the grill, I think it does and GM even rounded out the wheel wells. Hand Tools, Power Tools, Welders, etc / Really liking my Porter Cable 20v tools. I spouted about the impact a couple times in the Dewalt thread. But I have a couple more additions to the family and they work great. So far the 1/2 impact has not let me down. Last big use was for a some 3/8x12 lags for the addition. The regular impacts couldn't handle the big one but killed all the other SDS-Timberlocks. Tried it on a few lugs too. No problems on both the burbs 14mm and the 1101 trailer lugs. I have also fallen for the Senco Fusion trim nailer. Beside being great on trim and cordless just using the 18v battery (charged twice now). I use it to tack things up before screwing and it does great. General Maintenance, How to/DIY projects / Make your GM truck seats recline ALL THE WAY BACK! I read this on the other sight and have done a couple trucks now. About a 15 minute job and you need a small grinder is it. You pop off outside the rail cover for the seat you want to do. You just grind the collar off trying not to damage the threaded rod. You don't need to cut it all the way through, just enough to pry it off. Once removed just vacuum and put the cover back on and you have fully reclining seats!!! CIEMR / Not PC, God love em!!!!!!!!!!!!! Kids all need their own rooms, so this takes care of that. Daughter will get this and it will be bigger than all but the master bedroom. Pretty much on my own with this and it goes behind a 2nd story I put on the garage a few years back. I have no plans but what are in my head. It goes over the the laundry, bathroom and closet in the master bedroom. Total area is 12x16, but 3ft of the 16 is a stairway I built for this last year. So the actual room is 12x13. The area was actual built with this in mind and is close to flat. The highest part of the build will only stick up about 5ft from the ridge of the current roof. Hurdles are moving bathroom vents, HVAC vents and wiring. Much of this will be handled in a cubby next to the stairway. Another hurdle is the actual floor for this as my home is a modular and built with stick, not 2x4s. I have this on a schedule of 5-6 weeks to get it closed in. Another couple to finish the inside. This room will also have a stand alone HVAC unit, yet to be determined so comment are welcome (like they wouldn't come anyway) Another issue here is a whole house fan which will be relocated above the stairway. I will also be adding a 1/2 bathroom near the door that will serve the upstairs. Week 1; Roof tear off with truss removal. 3 days into this now. There are 3 roofs here . The original roof with a california truss under it and the roof I built over it when I added the garage. First day was opening up the stairway to the 2nd floor and tarping it off. Week 2; Moving all the above items and getting the floor in. I believe I will get to use 2x8s here and keep it level with the garage 2nd story. This step will show where my load is for the peak and I will pour a footing just to be safe even though I am tying into the load walls on both ends. This is the only real step I can see getting longer than scheduled. Week 3; Walls. The room should have a center ceiling at 8ft, with both sides coming down a little. These will basically be finished when they go up with 1 inch foam on the exterior. That will also vapor seal them with just flashing and siding needed. Using Smartside primed OSB, matching the house. Week 4; Roof. No fancy trusses just good ol 2x8s on 16 centers, about 10x12 roof is all. Stairs will be separate angled roof. Overhangs are 24" on the garage but I think 16 will be fine here and no gutters as it drips onto the roof. Since it ties into the current garage roof (2x10) I will simply drop it 2" down and run a flashing to the garage edge so no lacing the shingles. I am figuring a couple extra weeks just to be safe. The area is covered (still hot out), stairs closed in (but needs plastic sheet to temp seal it). Little camo to keep profile low. Anyone have a few 50 BMG cases laying around? Son saw a knife made with one so he wants to build one now. Firearms / My builds, or not? Just a little heads up guys as I live for now in the wonderful gun loving state of Kalifornia. I will let stand what I have posted but will not post my builds until I leave the state or the laws are changed. With all the upcoming laws, what will stand and what may be legal, I do not want to post what I may own or when I built it. I am trying to stay on the good side of the laws I disagree with, but for now I have to live with. July 1st and Dec 31st are when most take affect. Our Heros, The "Hooah" or "Ooh-Rah" Place / Pictures the press should post! Firearms / Like or not, the way of the future? Hand Tools, Power Tools, Welders, etc / Welder pics, Setup and advice with welding. Ok guys, lets get a little thread going on what you have for a welder. Mig, gas, tig or stick. Anyone have a GM 2500/3500 CV outer or the whole shaft? Looking to mod my engine stand and need that for my upgrade. Getting tired of my abbs as I work on the SUB so I finally got a Overhead creeper from Traxion. Got is for $242 shipped from Summit after price matching and a $25 coupon. The packing seemed OK, but a wheel hub was cracked and the upright support has a little tweek in it. It also had 1 wrong bolt in it (had a carriage bolt??) and I added a few better washers. Youngest wanted to build it, so I sat, took pictures and helped as needed which wasn't to bad. Now this is a great idea and I don't care if I piss some one off. Tate came through with a good deal on a recovery rope for us RMTWS guys, so thought I would post it up. This stuff is great looking and comes with its own storage bag that has a zipper pocket to boot. A little tricky to get all 7/8"x30' in there, but it fits. SO a couple pics to show it DID HAPPEN and was received the next day! I got a 4.5 since I don't like the flat trigger. CIEMR / Chilis to fund Planned Parenthood in Kent! General Maintenance, How to/DIY projects / 2006 LBZ Headlights, is there something better? I am tired of my 06 headlights. I have adjusted, tried new bulbs and cleaned them but all I get is 2 beams with no real side illumination. My lights are plenty bright (80/100watt) and I don't want to go HID, maybe LED but the reflector is the issue. Many of the newer vehicles have the projector lights that have a nice wide beam and would like something like this. Now this is a GMC Sierra, so what works for a Silverado won't help me. Any ideas here as I start searching other forums?? These were at the show I just attended and it was cool. You can tell it or fly it to do about anything. Not cheap, but not a killer either and the foldup format with 20 minute flights are great. Can be programed to follow anything, flys around objects, returns to home and then you can pack it into a case. CIEMR / New Proposed Ca gun laws. IE" Every semi auto is an assault weapon"
This is nuts and just proposed with everything with a Mag is an assault weapon. Well, since we have a new forum and I have played with this some, here is my take on a simple DIY water heater. Sure you have seen pictures and some how too's but everyone has diff needs so "roll" your own! I used just 1 roll (100') I believe and got 95F+ out of it in direct sunlight, showing about a 5-10F rise from the cooler pool. I used the included pool pump (intex) and garden hose sucking from the filter onto the roof of a shed (8ft rise) and running into the above ground pool. Just used 1/2 drip line (cheap). Firearms / Back in the market for a clip on NV. I thought there was another thread on this but couldn't find anything. I also can't have a real NV scope here in good ol Ca (another reason the leave). Looking at a NV clip on like a PVS. I got a bushnell 4.5x40 (digital) that has a mount but it is a little big/heavy and really doesn't focus. It works OK, but not up to what I want. Going to send it back. I guess a 1x24 or similar would have been better, but most have no way to be mounted. Looking at the Nait nvps 20 or similar. Real thermal would be nice but way out of the price range. Drones & Airborne Craft / something new for you guys. Follow mode, return to home and all real time! This is posted on CL and on Pirate, but you all deserve a spot too! 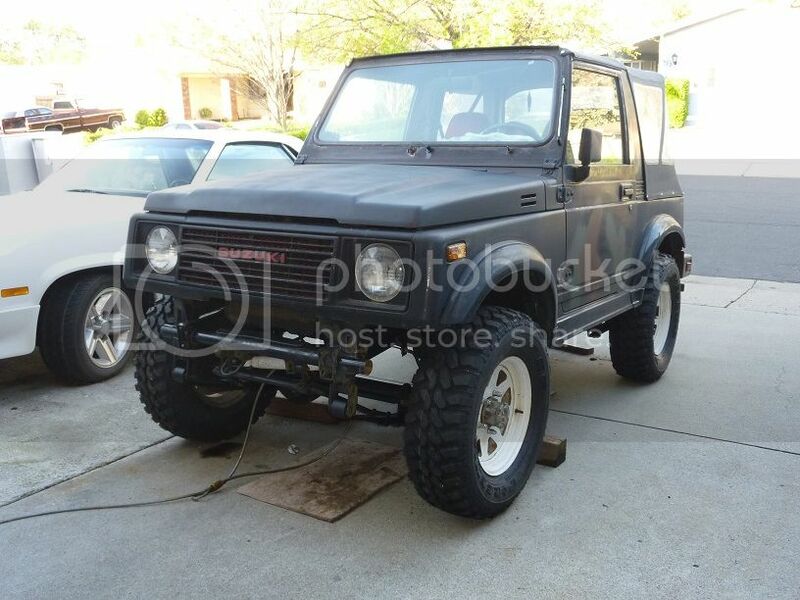 1986 Suzuki Samurai soft top. Project I started but have moved on to larger vehicles. It is non-oped so no back fees. It needs a good cleaning but has been tarped so the top is in good shape. Body is in good shape, no rust cept the window frame, but I have another for it! As it sits it is not running, but was when I parked it. Has a rod knock, but it ran/shifted good. 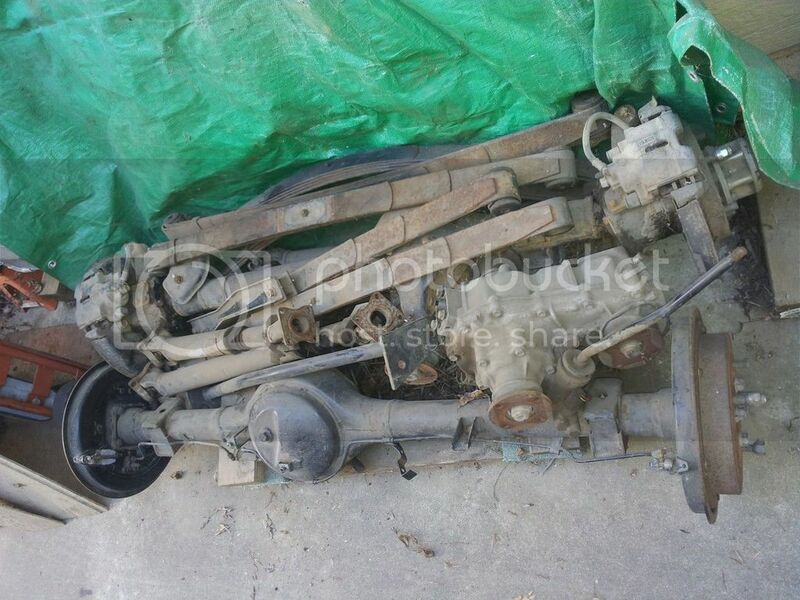 I have a 1.6ltr Tracker FI motor for it with all the major adapters and parts to put it in. The motor ran good when I pulled it. 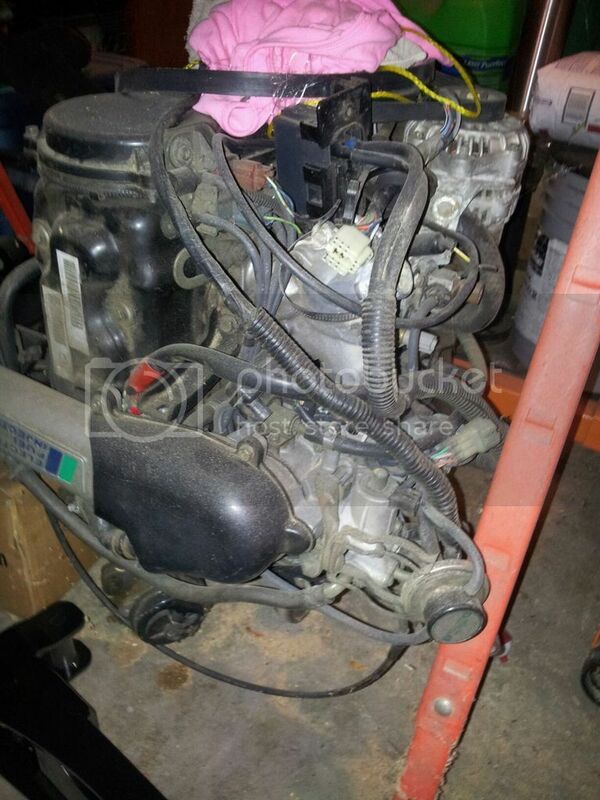 I have the stock ECM and harness too as well as a 1.6ltr toyota carb for it if you have no smog. I have also started to put the same tracker seats into it and it has the 2nd row seat. Has new tires (little bigger than stock) on stock wheels and a spare stock. Steering box locked up, but I have another for it. Sure I have missed something as there are boxes of parts for it, but you get the idea. Obviously, it will need to leave on a trailer. More pictures on request. Located in the Bay area, near Sac. 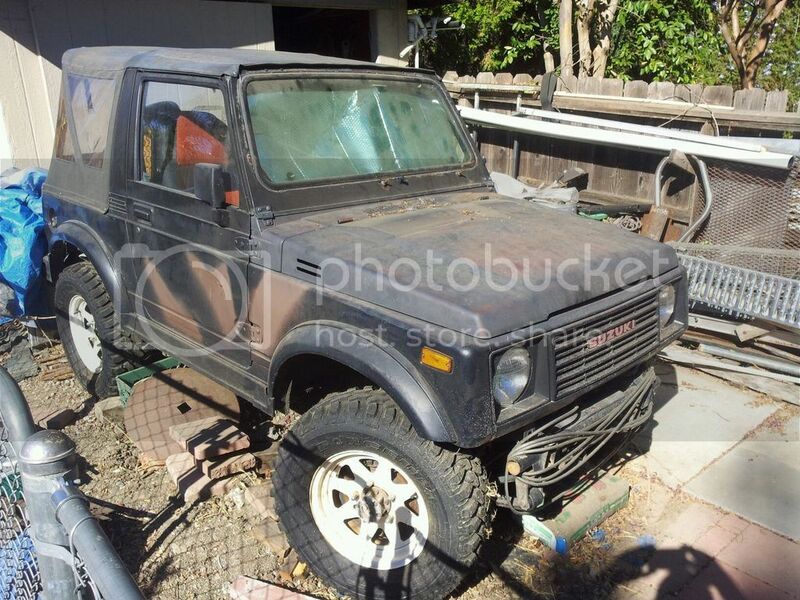 Asking $2500 which is way less than all the parts plus the sami. My mother in law just passed today from complications with her kidneys. She had been on dialysis for several years now with other related issues. We saw very little eye to eye, but she is in a better place now. I will be around but probably getting little done for a few weeks (like I had anyway). Everything Trailer, Camper, or RV related / Adding a shelf to the Shell. Never seem to have enough room in the shell as I carry alot like Don so real "available" packing space is limited. Now I will agree I do over do it some, but I would rather have than not. I do have a bed slider which helps some, but you must keep it all from sliding around and packing "up" so it doesn't slide around. So with a short bed (6.5ft) I figured about 1/2 of that could be a shelf. The 1st pic here is the inside with all the normal stuff. General Maintenance, How to/DIY projects / Dmax alternator time? So running my little RV cooler I noticed the running voltage was around 13.5, sometimes goes to .8 and sometimes a little lower than .5. This is on the CTS monitor and the dash shows about the same. This was after I unplugged the cooler to see if it was dragging in some. Batteries are just a year old, new interstates from costco. Before startup I see 12.4 on the CTS, so think I am good. Think I will through a meter on it first though to be sure, but it 10 years old. So I am thinking the Alt is on the way out. Now true it has been hot here (107 again today) and all runs fine but I know it should be about 14.5 volts when running. Called Napa and got a rebuilt (3 yr warranty) and found the Dmax has a clutch on the hub? Look at yours, closed front it has a clutch, nut showing it does not. Never heard of this but it is GM. So you have the $20 48 quart coolers that are OK for a day, maybe more with lots of ice or a block. Then you have the extreme cooler like Yeti, but cost several hundred bones!! In the middle I guess are the marine coolers with some magic vapor instead of foam for insulation. So beside dropping a huge amount of cash what works for you guys? I would like something a little smaller than 48qt that I can throw a block of ice in and its good a week. Is that possible?? Construction and Building / Stairs to man cave and new room. In building my garage back in 07-10 the plan was always to add a set of stairs and add a room above the one area next to that that didn't have a vaulted ceiling. Right now I have a pull down stairs just off center in the garage. Upstairs is huge, being 22x32. I built a 16x22 room in the center of this with storage rooms on both sides. Right now I have most of my RC hobby stuff up there and my kids have an HO train set. I even put a winch in that really helps with the big stuff. So I started the stairs by cutting a small access hole where it would come out upstairs. landing are code but the stairs will be a little narrow at 32". This is the room they are taking over, which will be a small office later. This topic has been moved to Construction and Building. CIEMR / Way to similar, not an accident!! There is the DIY like from gottrikes, then you buy dies. I do like this one being vertical. Basics from places like Protools, but look a little light duty. Found a couple both at summit and jegs, but cheap or pricey with everything. CL has em now and then, but people still pricey for anything worth while. I think this could be used vertical too and maybe even mounted to a receiver. I think Don has the JD model and have seen some of his work with it. I have thought about a portable generator for some time. Size, weight and $$ were an issue as I want to use it for camping and small projects. I already have a 5000watt for the house and 3000watt in the TH so backup here is set. Plus my solar has a 1500 watt circuit when the grid is down. Sound level was another factor along with run times to be user friendly. It also had to have a 12v charge outlet for obvious reasons and some smaller ones do not which I looked at too. I could go Honda or Yamaha but if you were lucky you got those for $1000. Both are around 45lbs and tend to be the standard. Westinghouse kept coming up and they even have a 2400 watt unit, but the price reflects that and closes in around $700. Still not bad, but I thought I could do better. After some searching I found the Wen 2000 watt Inverter-Generator. Watched a few videos (had time on my hand with my surgery) and it seemed to be right up there with the brands on power, weight and US support. It even has a 2 year warranty and was just $450 about everywhere. I ordered it via the local Sears, used my discounts and got it out the door for $435 with tax. Another reason I chose it was the engine is an exact copy of the Yamaha, so I ordered a magnetic dipstick for it. I wanted to deal with a local store if issues came up, so about a week later I picked it up. Even got the brand cover for it for another $14 as it may spend time on the shelf waiting. It came packed well with a nice tool kit and 12v charge cord. Manuals were sealed up but it included no oil. So cheap wally oil was obtained and the dipstick arrived. So kids were on a field trip to the 9/11 museum in NY saying they were to loud (as in amplified) and did not have a permit!! Although they DID have permission from another guard. That is a total disgrace and the guard should be fired, maybe deported US Citizen or not (rant). However I will say that NY stepped up and passed a law saying you CAN SING THE NATION ANTHEM anywhere. Well, having an issue at night with my dash lights. They turn on and work OK until I use the Cruise Control, then after a couple minutes they shut off. Everything works but the dash lights. When I apply the brake, they come back on, or when the truck accelerates or slows down in CC. So basically in CC they shout off, any change and they come back on, then go off again when CC starts. The DIC works fine. I am thinking the VSS or brake switch, possibly a ground as that can do strange things on its own.